It is a well documented and accepted fact that “a good night’s sleep” not only plays an essential part in maintaining a healthy body but also in healthy weight loss, and suffering from sleep apnea certainly doesn’t help. Unfortunately there are many, particularly those who are overweight or obese, who suffer from a sleep disorder called “sleep apnea”, which can be really debilitating, leading to stress and anxiety. There are two types of sleep apnea: Obstructive and Central. The central kind refers to the action of your brain as it sends the wrong signal to the muscles of your body that causes you to lack sleep and feel restless. Obstructive, being the most common, is the one we will be dealing with here. Obstructive sleep apnea (apnea is a Greek word meaning “to breathe”) is a condition whereby, for various reasons, during sleep your airways become partially, or in some cases, totally blocked. Sleep apnea should not be taken lightly, it is a condition that can lead to serious health problems, some of which can be fatal. Obesity and all the health problems related to it can also be attributed to sleep apnea in some sufferers. who are the most likely to suffer from sleep apnea? It is estimated that in the United States alone, over 12 million of the adult population could be experiencing obstructive sleep apnea. Of the people undergoing treatment for sleep apnea, around seventy-five percent had one thing in common: they were all overweight or obese. This gave rise to many researchers and experts believing that excess weight and obesity was a major risk factor in a person developing sleep apnea. Although excess weight and obesity is considered a major factor in the disorder, there are other underlying factors that contribute to sleep apnea, and in some cases it is believed to be hereditary. One of the major causes of sleep apnea is the throat muscles, and in some cases, even the tongue, that normally stay tight during waking hours to keep the airways open, relax too much, restricting or blocking the air flow to the lungs and, consequently, reduced oxygen to the brain. When this happens it may be accompanied by loud snoring and a significant drop in blood oxygen levels. If blood oxygen falls to a dangerous level it may cause the person to stop breathing. This will trigger the brain to start sending signals to disturb or even awake the person from sleep, normally accompanied by loud grunts rather than snoring as the person gasps for breath in an attempt to restore normal breathing, which will increase the airflow to their lungs and also increase blood oxygen levels. If this happens frequently while sleeping, and on a regular basis, due to constantly disturbed or lack of sleep, it could lead to some serious health problems, not least of which is obesity and type-2 diabetes, which we will be discussing later. This constant reduced or lack of sleep may also lead to the release of stress hormones which may increase the heart rate, which can cause other serious health problems such as hypertension, strokes, heart attacks, and sometimes irregular heartbeats causing panic attacks. Research has shown that people suffering from sleep apnea, particularly if they have a history of cardio-vascular problems, are more prone to fatal heart attacks during sleep than those who don’t have the disorder, where, generally, heart attacks occur during their waking hours. Other causes of sleep apnea can be tonsils, tongue, or both, that are larger than normal; being overweight to the extent where extra fatty tissue may thicken the wall of the windpipe, reducing the airflow. A large bony structure in the head and neck areas could also lead to a narrower than normal airflow in the throat, and possibly, also the mouth. Without professional diagnosis, which is virtually impossible with only routine clinical visits to your doctor, it’s hard to know if a person is suffering from sleep apanea as they don’t’ realize what is happening while they are asleep, only that something woke them up. 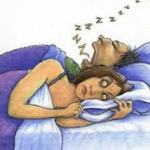 If this happens several times during the night it is possible that they may be suffering from sleep apnea and need to seriously consider seeking help or advice. One of the signs that someone may be suffering from sleep apnea is drowsiness and a feeling of tiredness during the day. In some cases they may actually fall asleep while eating a meal or reading something. This can be extremely dangerous if it happens when they are working with heavy machinery or driving. Research has also shown that people suffering from sleep apnea are more prone to car accidents than non-sufferers. Everybody has a restless or sleepless night now and again due to any number of reasons, but if they occur on a regular basis, seek help and advice. are there any other symptoms I can look for? Yes, there are: Lack of concentration; psychological problems such as anxiety, irritability, mood and behavioral changes, including depression. Although there may be other underlying factors causing these symptoms, if they are linked to other signs of possible sleep apnea, again seek help and advice. The first step if you think you may be suffering from sleep apnea, or any sleep disorder, is a visit to your doctor. Explain any symptoms you may have, such as drowsiness or falling asleep during the day, a feeling of constant anxiety or irritability, mood swings or changes in behavior. These are just a few of the many symptoms associated with sleep disorders such as sleep apnea. Sleep apnea treatments are designed to meet two goals. One is to relieve symptoms and two is to normalize breathing patterns. There are various treatments available, but don’t expect your doctor to issue a prescription, as there are no approved pills or injections for sleep apnea treatment, and clinical procedures such as blood or urine tests won’t detect any sleep disorder you may have. Your doctor may recommend asking your roommate or sleeping partner to keep a record of your snoring and grunting while you are asleep. You’re probably keeping them awake anyway, so it shouldn’t be too much of a problem, as if it helps in finding a way to improve the condition it will benefit them as well. It might be an idea to use some sort of recording device to monitor the snoring and grunt levels while you are asleep, particularly if you sleep alone. This may help your doctor or specialist in treating sleep disorders to assess your condition and recommend the appropriate treatment. how is sleep apnea detected? If your doctor suspects you may have a sleep disorder such as sleep apnea, you may be referred to a sleep center. Although some of these tests can be done at home under supervision, they may prefer for you to stay in the center overnight so they can monitor more thoroughly your sleeping patterns during the night. These tests will be carried out by doctors and physicians who specialize in analyzing and treating sleep disorders. Polysomnography is the most extensive test, recording the bodily changes that occur during sleep and is considered as the standard test in diagnosing sleep apnea and its severity. It is mainly performed at night, when most people sleep, though there are some facilities that can accommodate people with circadian rhythm sleep disorders – people who sleep outside of what are considered normal sleeping hours – and shift workers who would normally sleep during the day. The activities of the brain, heart, and lungs; eyes, arm, and leg movements; oxygen levels; air flow; breathing and respiratory patterns; and heart rate are all monitored and recorded by the polysomnography. An overnight test that’s done at home by means of a sleeve that is fitted into the finger and monitors the oxygen levels in the blood. This will show if there are any abnormalities in the oxygen levels in the blood. Low levels of oxygen registered by the sleeve means a case of sleep apnea. An oximetry test cannot screen all cases of sleep apnea, once sleep apnea has been confirmed, doctors will normally run polysomnography tests to confirm and validate oximetry results. This test is carried out to test excessive daytime sleepiness. It measures how fast a patient falls asleep by allowing them opportunities to sleep during the day. Normally it takes a person not suffering a sleep disorder around 10 to 20 minutes to fall asleep. A person suffering from a sleep disorder, particularly those with sleep apnea, will fall asleep in less than five minutes. Designed to use at home, these are simplified tests that measure airflow and breathing patterns, among other things. However, these tests are only done on the recommendation and supervision of the attending physician or qualified sleep specialist once comprehensive sleep evaluation has been confirmed. As previously mentioned, there are no prescription medicines, drugs or clinical procedures that will alleviate the symptoms or cure sleep apnea. Treatment of the condition range from a change of lifestyle to, in really extremely severe cases, surgery. Lifestyle changes are aimed at treating mild cases of sleep apnea. For instance, being obese or overweight can contribute to the narrowing of the airway, and losing weight can significantly alleviate sleep apnea. It’s also important to avoid medicines that can further relax throat muscles and may cause sleepiness including alcohol, sedatives, and sleeping pills. Tobacco is also a form of mild sedative and should be avoided. Try to avoid sleeping on the back as it is more likely to relax the tongue and palate and thus block the airway. Sleeping on the side is found to help people with sleep apnea. I’ve heard of cases where sufferers have strapped something that makes it uncomfortable if they try to sleep on their back and automatically return to sleeping on their side. Also, some sufferers have found saline nasal sprays helpful in keeping the nasal passages open. Sleep apnea may either be the cause or result of other medical conditions. Treating such diseases as hypertension, diabetes, and heart ailments can help alleviate sleep apnea. Basic treatment options are used in treating sleep apnea of different severities and include mouthpieces and breathing devices. Examples are Continuous Positive Air Pressure (CPAP) and Mouthpieces. A mask-like device connected to a machine and recom-mended for people with moderate to severe sleep apnea. Worn over the nose while sleeping, it delivers pressurized air to prevent the airway from narrowing. A custom-fit dental device resembling the common athletic mouth guard, are designed specifically by a dentist or orthodontist. They prevent sleep apnea by adjusting the lower jaw and tongue, thus keeping the airway open. Other more advanced devices include bi-level positive air pressure (BiPAP) and adaptive servo-ventilation (ASV). Obviously the least liked by sleep apnea sufferers, the main purpose of surgery is to keep the airway wide and open, thereby allowing the free flowing of air. Surgeries are normally done on people with severe sleep apnea, but surgical operations are based on what is causing the problem. One type of surgery will remove excess tissues from the throat and soft palate that block the airway. while others shrink tissues in the mouth and throat. Some operations may also include the removal of enlarged tonsils and adenoids, and if necessary, reconstruction of the lower jaw. Surgery is known to confer long-term and even permanent benefits, but, like all surgery, it sometimes can carry risks and most physicians and sleep disorder specialists will only recommend it as a last resort. That just about sums up the problems that can be caused by sleep apnea and how it can be treated. If you feel you may be a sufferer, please consult your doctor, the serious health problems that can result from sleep apnea are real, not imagined, and, in extreme cases, can be fatal.